Emily was enumerated in the 1900 Oshkosh, Winnebago Co., WI, federal census, ED 141. She was 49, divorced, and sewing. Children in the household were Bessie 15, Edna 11, Phebe 9, and Dewitt 6. Dewitt and "Mary" were enumerated in the 1920 Hoquian, Grays Harbor Co., WA, federal census, ED 89. He was a teamster age 25, she was 24. Children in the household were Helen M. 4, and June Phoebe 1. Dewitt S. and Marie were numerated in the 1930 Hoquiam, Grays HarborCo., WA, federal census, ED 39. He was a yard man at a lumber mill, age 36; she was 34. Children in the household were Helen 14, and June 12. Phoebe June Munson was the daughter of Dewitt Samuel Munson and Marija Vezmarovic.1 Phoebe June Munson died on 8 March 1964. Norita Bosarge married Robert Eugene McCafferty, son of John James McCafferty and Doris Gertrude Fowler. Norita Bosarge died. Frank and Lavinia C. were enumerated in the 1910 Columbus, Lowndes Co., MS, federal census. He was a cotton merchant, age 38, she was 31. They had been married 4 years and had not had any children. Frank P. and Lavinia were enumerated in the 1920 Columbus, Lowndes Co., MS, federal census, a cotton merchant, age 40; she was 42. They were in the household of her parents and no children were enumerated. Frank and Lavinia were enumerated in the 1930 Columbus, Lowndes Co., MS, federal census. He was the manager of a cotton office, age 57, she was 51. Also enumerated in the household was mother-in-law Julia Robertson, widowed age 72. Betsey (?) was born circa 1810 at VT. She married Hyman Holcombe, son of Noah Holcombe II and Betsy Cadwell. The Goddard genealogy gives Zervah's birth as 1788 and death as 7 Aug 1872. [S418] Ruth Cost Duncan, John Case 2nd Edition, Page 60, Item 134. [S498] Winfred R. Goddard, Granby Goddards, Page 68, Item 365. [S178] Christina Bailey and Lorraine Cook White, Barbour: Granby, Page 99. [S45] Albert C. Bates, Simsbury, Page 101. Byron and Abigail were enumerated in the 1850 Granby, Hartford Co., CT federal census, page 154. He was a farmer, age 45, she was 47. Children in the household were Horatio 20, Mary 12, and Byron P. 6. Byron and Abigail were enumerated in the 1860 Granby, Hartford Co., CT, federal census. He was a farmer age 55, she was 59. The only child in the household was Byron 16. Byron and Abigail P. were enumerated in the 1880 Granby, Hartford Co., CT, federal census. He was a farmer age 76, she was 79. Also in the household was daughter-in-law Marilla, 23. Horatio is listed on the Granby Civil War Memorial. He was an MD and served as Asstant Surgeon with the Connecticut Volunteers in the Civil War. He died while returning from the service. 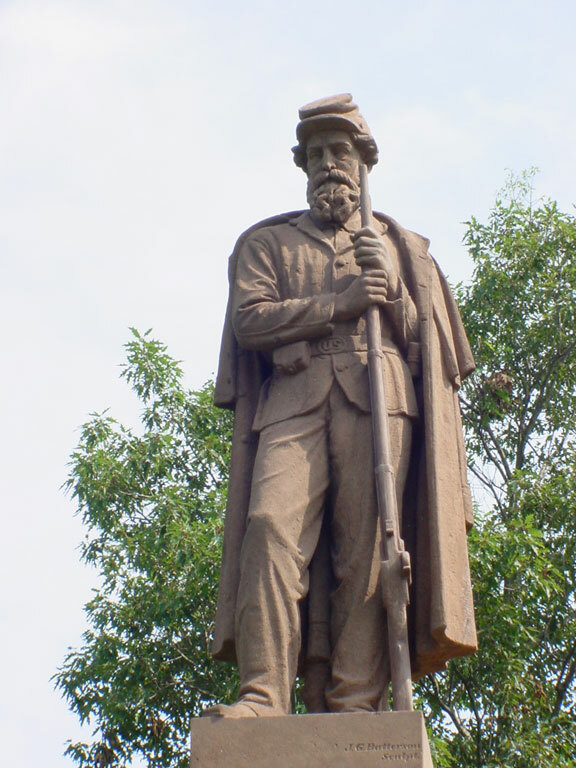 A complete history of the 16th can be found at: History of the 16th Connecticut Regiment, Volunteer Infantry. [S498] Winfred R. Goddard, Granby Goddards, Page 67, Item 36. Widow Mary Granger was born circa 1754.1 She married Nicholas Goddard, son of John Goddard Jr. and Mary Hillyer, on 22 October 1772. Children of Margaret (?) and James Harvey Holcombe Jr.
Noah Holcombe III was born in 1818 at NY.1,2,3 He was the son of Noah Holcombe II and Eunice (? )1 Noah Holcombe III married Emily Crane.2 Noah Holcombe III died in 1877. He was buried at Knowles Cemetery, LaGrange, Lorain Co., OH. Noah Jr. and Emily were enumerated in the 1850 LaGrange Twp., Lorain Co., OH, federal census (stamped page 479), in the household of his father, Noah Sr., age 70. He was a farmer age 51 (should be read as 31), she was 29. Children in the household were Rufus 12, Jane 10, Ellen 8, Melville 6, Charles 4, and Winfield 2. Noah and Emily were enumerated in the 1860 LaGrange, Lorain Co., OH, federal census. He was a farmer age 42, she was 40. Children in the household were Rufus 22, Jane 20, Melville 16, Charles 14, Scott 12, Andrew 10, and Esther 6. Rufus Holcomb age 22 was enumerated next door with a wife Sally 17; probably the same. Noah and Emily were enumerated in the 1870 LaGrange, Lorain Co., OH, federal census. He was a farmer age 52, she was 50. Children in the household were Scott 21, Andrew 19, and Esther 17. If Noah was 31 in the 1850 census, that agrees with the 1860 census and makes him born in 1818. [S25] Hannah McPherson, Holcombe Genealogy, Page 213.1. There are two Laomi Holcombe men in this family that can be confused. Laomi son of Laomi, and Laomi son of Noah. They are first cousins, and their common ancestor is Noah (b. 1752). Barry Boyer of Ritzville, WA, has the family continuing under Laomi, son of Laomi. Asahel Holcombe was born circa 1813 at NY.1 He was the son of Noah Holcombe II and Eunice (? )1 Asahel Holcombe married Fanny Hastings.2 Asahel Holcombe married Maria Hunter. 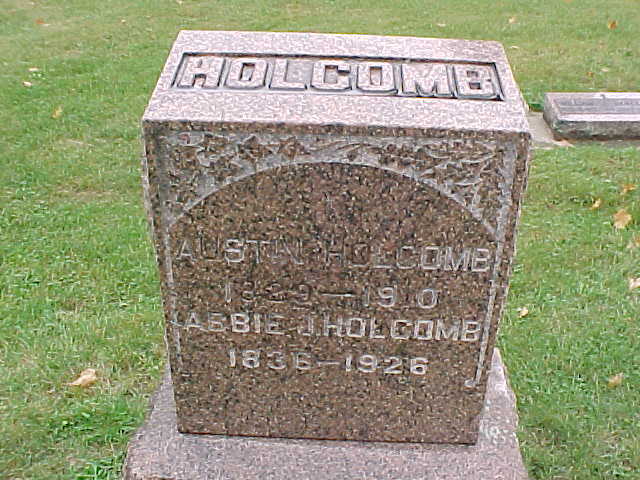 Asahel Holcombe died on 13 March 1867. He was buried at Knowles Cemetery, LaGrange, Lorain Co., OH. Asahel and Fanny were enumerated in the 1850 LaGrange Twp. Lorain Co., OH, federal census. He was a carpenter age 36, she was 35. Children in the household were Ai 11, Richard 10, and Grisila 7. McPherson places D. F. in the family of Noah but there is no concrete evidence for doing so. He does not appear in proximity of Noah in the 1850 census and is near only Laomi in the 1860 census. In fact, evidence would indicate that he was never in Ohio at all. D. F. and Anna were enumerated in the 1860 Ft. Atkinson, Koskoning, Jefferson Co., WI. He was a farmer age 45, she was 42. Children in the household wee George 11, and Mary 2. This could be the Daniel F. Holcombe, b. 1813, d. 1882 who enlisted 31 Aug 1861 in Company G., 11th WI Infantry; discharged 29 Jul 1865, from Arena, Crawford Co., WI; buried Wautoma Union Cemetery, Wautoma, Waushara Co., WI. Hannibal and Sally "Hocom" were enumerated in the 1850 LaGrange, Lorain Co., OH, federal census. He was a carpenter age 29, she was 28. Children in the household were Charlotte 9, Aurora 8, Julia 6, Rosalia 3, and Viola 1. Darius and Sally were enumerated in the 1850 LaGrange Twp. Lorain Co., OH, federal census. He was a carpenter and joiner age 28, she was 31. Children in the household were Pearce D. 7, and Emeline 5. Darius and Sally were enumerated in the 1860 LaGrange Twp., Lorain Co., OH, federal census. He was a carpenter, age 38; she was 41. Children in the household were Perceival, 17, Emeline, 15, Wesley?, 9, Mary 6, and Ella 4. They are dwelling 748, Family 804 and have lines 28 through 34. Darius and Sally were enumerated in the 1870 LaGrange, Lorain Co., OH, federal census. He was a hotel keeper age 48, she was 56. Children in the household were Irvin W. 19, Mary B. 16, Ella 14, and McCallan 7. "David" and Sallie were enumerated in the 1880 LaGrange, Lorain Co., OH, federal censu. He was a salonist, age 58, she was 61. Children in the household were Ella 22, and Mac 17 a saw mill hand. Nahum Holcombe was born circa 1824 at NY.1 He was the son of Noah Holcombe II and Eunice (? )1 Nahum Holcombe married Matilda Hastings on 30 March 1842.2 Nahum Holcombe died circa 5 December 1900. Nahum and Matilda were enumerated in the 1850 LaGrange Twp. Lorain Co., OH, federal census. He was a farmer age 26, she was 26. Children in the household were Alonzo 4, George 2, and Harriett 1. Nahum and Matilda were enumerated in the 1860 LaGrange, Lorain Co., OH, federal census. He was a carpenter, age 36, she was 36. Children in the household were Alonzo 14, George 12, Harriet 10, Estella 8, Allista 6, Mary 5, and Ida 3. Nahum and Matilda were enumerated in the 1870 LaGrange, Lorain Co., OH, federal census. He was a carpenter age 46, she was 46. Children in the household were Elista 16, Mary 15, and Ida 13. Benjamin W. Holmes, grandson age 3. Nahum was enumerated in his daughter Ida's household in the 1900 Carlisle Twp. Lorain Co., OH, federal census; residence and household 24. Ida had remarried Oscar Bingham, a carpenter, age 50, she was 43. On December 5, 1900, The Elyria Reporter announced Nahum's death, but the column is not completely legible so the exact date is not available. Emily Crane was born in July 1820 at NY.1,2 She married Noah Holcombe III, son of Noah Holcombe II and Eunice (? ).1 Emily Crane died in 1901. She was buried at Knowles Cemetery, LaGrange, Lorain Co., OH. Children of Patience Pelton and Laomi Holcombe Jr.
Wardsey Searle Holcombe was born on 26 January 1827 at Lorain Co., OH.1 He was the son of Laomi Holcombe Jr. and Patience Pelton.2,1 Wardsey Searle Holcombe married Mahala E. (?) before 21 February 1853 at Lorain Co., OH.1 Wardsey Searle Holcombe married Margaret Catherine Cront on 17 July 1855 at Concord, Jefferson Co., WI.1 Wardsey Searle Holcombe died on 7 September 1903 at Leola, Adams Co., WI, at age 76.1 He was buried at Colburn-Leola Cemetery, Leola, Adams Co., WI. Wardsey had moved from LaGrange, Lorain Co., OH to Leola, Adams Co., WI, between 1853 and 1855. Wardsey and Margaret were enumerated in the 1860 Concord, Jefferson Co., WI, federal census. He was a farmer age 33, she was 22. Children in the household were Lewis A. 4, George 2, and Malvina 1. Laomi was his nearest neighbor. Wardsey was 5 ft. 6-7 inches tall, of dark complexion and hair, gray eyes, a farmer. Enlisted at Watertown, Jefferson Co., WI, Aug 21, 1862 as a private in Co. B., 29th WI Vol. Inf., then a resident of Hancock, Waushara Co., WI; mustered Sep 27, 1862 at Madison, WI, -- Capts T. R. Mott and Gibbs; marched with his Regt. Apr 1863 from Milligan Bend to Fort Gibson and fought in battle there May 16, 1863 and at Champaign Hills; next marched to rear of Vicksburg, Miss. After surrender of Vicksburg, was sent up Miss. River from Natchez, Miss, Aug 2, 1863 to Jefferson Barracks, St. Louis, MO, whre he was sick in hospital in Sept and Oct 1863; next sent for a few days to St. Louis, MO before Invalid Corps; discharged Nov 5, 1863, deaf in right ear from cannonading. His application for pension for the above services was witnessed by Austin Holcombe. Wardsey and Margaret were enumerated in the 1870 Friendship, Leola, Adams Co., WI, federal census. He was a farmer age 43, she was 33. Children in the household were Lewis A. 14. George W. 12, Mary M. 11, Clark W. 9, Rosa A. 7, Clara A. 6, Emily Jane 3, and Elizabeth C. 1. There are no other Holcombe families in the 1870 Leola census, but there is an 8-year-old Harriet Holcombe, born in Wisconsin, living in the family of David Yorty, a stone mason; only a few households from Wardsey. Wardsey and Margarit were enumerated in the 1880 Leola, Adams Co., WI, federal census. He was a farmer age 53, she was 42. Children in the household, all born in WI, were Clark 18, Rosa 17, Clara 15, Elinor 13, Elisabeth 11, Sarah 8, Otis 7, Lucetta 5, Helen 4, and William 2. Son Lewis was enumerated next door. Wardsey and Margaret were enumerated in the 1900 Colburn, Adams Co., WI, federal census. He was 73, she was 62. Children in the household were Helen 24, William 22, and Annie 19. Anita Reid gives a death date for Wardsey as 29 Apr 1904. Austin Holcombe was born on 27 June 1830 at Lorain Co., OH.1,2 He was the son of Laomi Holcombe Jr. and Patience Pelton.1 Austin Holcombe married Abigail Jane Wanzer on 24 March 1859.3 Austin Holcombe died in 1910. He was buried at Lake View Cemetery, Jefferson Co., WI. Austin and Abby were enumerated in the 1860 Farmington, Jefferson Co., WI, federal census. He was a farmer age 28, she was 23. the only child in the household was Martha, 2. Austin and Abby were enumerated in the 1880 Concord, Jefferson Co., WI, federal census. He was a farmer age 49, she was 42. Children in the household were Laomi 19, Abbie M. 14, William 10, Austin 7, and Maud 1. Austin and Abby were enumerated in the 1900 Sullivan, Jefferson Co., WI, federal census. He was 69, she was 68. The only child in the household was Maud, 21. Austin and Abby had been married 41 years and had seven children, all still living. A. and A. Holcombe were enumerated in the 1910 Ft. Atkinson, Jefferson Co., WI, federal census in the household of daughter "M. E." Nutting, age 51, widowed with no children, probably Martha. Austin was 80, Abby was 74. Lucretia Holcombe was born circa 1831 at OH.1 She was the daughter of Laomi Holcombe Jr. and Patience Pelton.1 Lucretia Holcombe married Allen Welcher on 30 July 1850. Allen and Lucretia were enumerated in the 1850 Concord, Jefferson Co., WI, federal census. He was a farmer age 20, she was 19. They were immediately adjacent to her parents. However, like her parents, she was also enumerated in October in Lagrange, Lorain Co., OH, this time within her parent's family with no husband around. Allen and Lucretia were enumerated in the 1860 Farmington, Jefferson Co., WI, federal census. He was a carpenter, age 29, she was 26. Children in the household were Ellen 8, Mary 6, and Eustice 4. They were enumerated very near Lucretia's brothers George and Austin.